The United Kingdom: A European Nation or Islands Set Apart? The much-debated and highly-publicized June 2016 “Brexit” referendum, in which a narrow majority of British citizens voted to leave the European Union, made newly apparent what has, in fact, been a centuries-old dynamic between the British Isles (England, Ireland and Wales) and the European continent. Since at least the days of the Roman conquest of southern England, the relationship between these North Atlantic islands and the rest of Europe (especially France, Germany, Spain and Italy) has been complex, vexed and ever-changing, at times manifesting points of connection and similarity, at other times highlighting difference and a supposed “singularity” or “exceptionality” of the British nation and its peoples. Honors College students enrolling in IDH 4007 will study British history, culture, religion, literature and art, and advances in science, technology, medicine and engineering (always in relation to European trends and linkages) from the pre-Roman and Roman eras, through the Middle Ages, Renaissance, Restoration and Enlightenment, Industrial Revolution, Victorian and Edwardian ages, the World Wars of the last century, and right up to our contemporary moment. The learning in IDH 4007 will then be tested and extended in situ, as participants travel throughout the U.K. in the summer, under the IDH 4008 rubric, observing how the Britons have contributed to the course of human history over the past 2500 years. Make an educated decision! 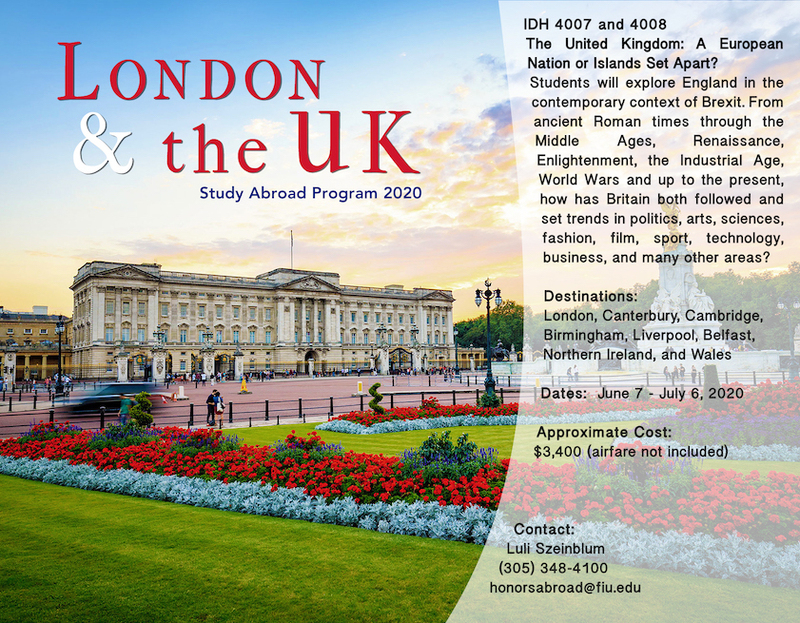 Check out the March 21, 2019 Study Abroad Honors Hour on the UK program HERE! SO, WHO IS THIS PROGRAM INTENDED FOR? Essentially, this program is ideal for any Honors College student with a strong interest in London and the UK, irrespective of major and course of study at FIU. While common course work, assignments, and travel will emphasize history, culture, the arts and design, politics and social trends through time, this should not preclude students working in the sciences and engineering, pre-med and nursing, business, or hospitality from enrolling. Quite the opposite, the participation of students from a range of disciplines will only make the course stronger, and its interdisciplinary aspirations more fully realized. In short, this UK Study Abroad trip aspires to embody the very principles of broad learning and inquiry in a range of disciplines that the FIU Honors College promotes. Indeed, all are welcome. WHERE WILL WE TRAVEL WHEN WE ARE IN THE UK? We’ll spend two intense, exciting weeks in London, with day-trips to Canterbury, Cambridge, Hampton Court and either Greenwich or Lullingstone Roman villa. Then, we’ll head west by northwest, traveling to Oxford or Stratford-upon-Avon, Birmingham, Liverpool, and on to Belfast and Northern Ireland. This will be followed up with four sublime days in northwest Wales (Snowdonia and Caernarfon), and then the trip will end with visits to Cardiff, Bristol, Bath and Salisbury. This extended two-week adventure will include trains, buses, ferries and planes! We’ll be in London from June 7– June 22, and then traveling in the west, Northern Ireland, and Wales from June 22 – July 6, 2020. WHY IS THIS A SUMMER C COURSE? Our travel dates straddle Summer A and Summer B, primarily to accommodate Professor Sutton’s family schedule (he refuses to miss his son’s high-school graduation!) Please keep in mind that while in England, your job is to see things, experience the country, take in the sights, and explore. You are essentially conducting research, or doing your “field work,” for your independent project for IDH 4008. 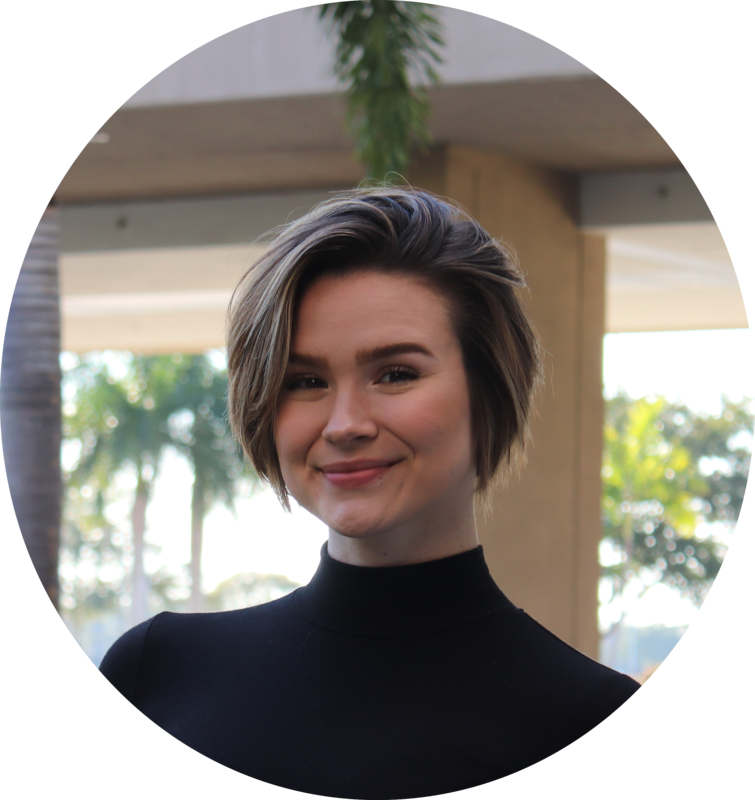 When you return to Miami in early July, you will have about three weeks (the remainder of Summer B term), to pull together all of your findings and discoveries made whilst abroad, and craft a beautifully cogent, extended essay or project. Please note that the dates of travel abroad probably preclude your registering for face-to-face courses in either Summer A or Summer B. However, online courses, especially in Summer A term, if necessary, would be possible. HOW ARE WE GOING TO GET AROUND? While we’re in London, we’ll travel by foot (plan to walk a whole lot! ), by those iconic red double-decker buses, and by subway (London’s tube.) Most rail travel outside of London will be on main-lines, with Brit-rail; small-gauge steam rail could feature prominently in Wales, as will bus travel. A quick flight from Liverpool to Belfast is likely, and a ferry sea-crossing, from Belfast to Holyhead, Wales (via Dublin), also is in the offing. WHERE ARE WE GOING TO LIVE WHILE WE’RE IN ENGLAND, NORTHERN IRELAND, AND WALES? In London, students will stay at the FSU Study Center; this is a beautifully appointed, state-of-the-art facility, located very near the British Museum on Great Russell Street. Outside of the capital, students will lodge in a mix of “Bed & Breakfast” hotels—a grand British form of accommodation and hospitality—or clean but inexpensive hotels. The cost of the 2020 UK program is $3,400. It will include housing for the duration of the trip; local transportation; admission to numerous museums, monuments and other sites; theatre and concert tickets; and mandatory insurance. Program costs DO NOT include: $350 Honors College fee and $175 Study Abroad non-refundable fees, FIU instructional fee (6 credits, $205.57 per credit), airfare, meals, and personal expenses. Professor James Sutton hales from the Midwest; he received undergraduate and Master’s degrees in English from Northwestern and Michigan, and holds a Ph.D. in Renaissance Studies (1995) from Yale. His early research focused on the interplay of art, architecture, dramatic performance, politics and court intrigue during the reigns of Queen Elizabeth I and King James I; he is currently researching and writing about “glocal” Shakespeares, in Slovenia and here in South Florida; he is also coediting a book on Exile with Professor Asher Milbauer, a colleague at FIU. Sutton is an Associate Professor in FIU’s English department, which he chaired from 2008-2016. During 2016-2017, Sutton spent six months in Slovenia, teaching and travelling. He joined the Honors College—a long term goal—in the fall of 2017, teaching a pod of IDH 1001 and 1002 with colleagues from Physics, Biology, Law, and Religious Studies. He has also been director of the long-successful FIU Study Abroad program, “Shakespeare in England;” he looks forward to new endeavors in England and the UK with FIU Honors College students, as part of this (still relatively new) study abroad program. If you have any questions, please reach out to him at suttonj@fiu.edu. United Kingdom: A European Nation or Islands Set Apart?